Performance Engineering from the Node Level to the Extreme Scale. Two-part minisymposium at SIAM PP18, the 2018 Conference on Parallel Processing, Tokyo, Japan, March 7-10, 2018. Foundations and Applications of Performance Engineering. Minisymposium MS05 at The Platform for Advanced Scientific Computing (PASC) Conference 2018, Basel, Switzerland, July 2-4, 2018. High-Performance Graph Algorithms. Minisymposium MS23 at The Platform for Advanced Scientific Computing (PASC) Conference 2018, Basel, Switzerland, July 2-4, 2018. Computing Bulks of Inner Eigenpairs of Large Sparse Matrices: From Applications and Algorithms to Performance and Software Engineering. Two-part minisymposium at PASC 2017, the Platform for Advanced Scientific Computing Conference, Lugano, Switzerland, June 26-28, 2017. ESSEX-II Coding Week. 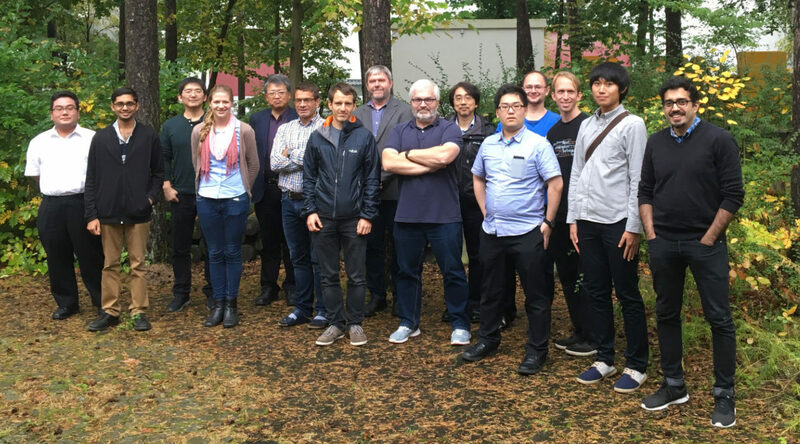 Informal coding workshop at the University of Erlangen, Germany, September 19-22, 2016. Quantum Dynamics: From Algorithms to Applications. Workshop at the Alfried-Krupp-Wissenschaftskolleg Greifswald, Germany, September 05-08, 2016. Performance Modeling: Methods and Applications (PMMA16). Workshop at ISC High Performance 2016, Frankfurt, June 23, 2016. Performance Modeling: Methods and Applications. Workshop at ISC High Performance 2015, Frankfurt, July 16, 2015. Sparse Solvers for Exascale: From Building Blocks to Applications. Workshop at the Alfried Krupp Wissenschaftskolleg Greifswald, March 23-25, 2015. SPPEXA PhD Seminar. Weekly seminar during summer term 2014, jointly organized by PIs of the SPPEXA projects ESSEX, ExaStencils, and TerraNeo. New Algorithms for Exascale Computing. Workshop at the University of Cologne, December 4-6, 2013, Cologne, Germany. Jonas Thies: Holistic Performance Engineering for Sparse Iterative Solvers. PASC MS05, Basel, Switzerland, July 2-4, 2018. Georg Hager: Performance Engineering – Why and How? PASC MS05, Basel, Switzerland, July 2-4, 2018. Christie Louis Alappat: RACE: Recursive Algebraic Coloring Engine. PASC MS23, Basel, Switzerland, July 2-4, 2018. Gerhard Wellein: Chebyshev Filter Diagonalization on Modern Manycore Processors and GPGPUs. ISC High Performance 2018, Frankfurt, Germany, June 24-28, 2018. Georg Hager: “If it doesn’t work, we learn something.” Instructive case studies from performance engineering. Minisymposium MS29 at SIAM PP18, the 2018 Conference on Parallel Processing, March 8, 2018, Tokyo, Japan. Gerhard Wellein: Performance Engineering for Sparse Linear Algebra Kernels: Navigating Between Models and Expectations. Minisymposium MS85 at SIAM PP18, the 2018 Conference on Parallel Processing, March 9, 2018, Tokyo, Japan. Gerhard Wellein: Performance Engineering for Scalable Sparse Eigensolvers in the DFG Project ESSEX: From basic building blocks to full scale applications. JST/CREST International Symposium on Post Petascale System Software, December 12th, 2017, Tokyo, Japan. Gerhard Wellein: Performance Engineering: Welcome to the world of FLOPs, Bytes and Cycles!. 34th ASE Seminar, December 13th, 2017, The University of Tokyo, Tokyo, Japan. Gerhard Wellein: Performance Engineering for HPC: Models generating insights. EoCoE Face-to-Face Meeting Autumn 2017, Toulouse, France, November 29, 2017. Andreas Alvermann: Interior eigenvalue and eigenvalue density computations in quantum physics applications. PASC Minisymposium “Computing Bulks of Inner Eigenpairs of Large Sparse Matrices: From Applications and Algorithms to Performance and Software Engineering” PASC’17, June 26-28, 2017, Lugano, Switzerland. Tetsuya Sakurai: Development of a Scalable Parallel Eigensolver for Large-Scale Simulations and Data Analysis. SPPEXA Workshop “Parallel Programming Models – Productivity and Applications (2nd Edition)”, October 18, 2017, Université de Versailles St-Quentin-en-Yvelines, Versailles, France. Kengo Nakajima: Preconditioned Iterative Solvers in ppOpen-HPC/pK-Open-HPC for ESSEX-II. SPPEXA Workshop “Parallel Programming Models – Productivity and Applications (2nd Edition)”, October 18, 2017, Université de Versailles St-Quentin-en-Yvelines, Versailles, France. Georg Hager: Overview of the ESSEX-II project. SPPEXA Workshop “Parallel Programming Models – Productivity and Applications (2nd Edition)”, October 18, 2017, Université de Versailles St-Quentin-en-Yvelines, Versailles, France. Martin Galgon: Meet the BEAST. RIKEN LSPANC Meeting, Kobe, Japan, September 29, 2017. Sarah Huber: Reducing linear system size with moment based methods in the FEAST framework. RIKEN LSPANC Meeting, Kobe, Japan, September 29, 2017. Gerhard Wellein: Sparse iterative solvers, asynchronicity and fault tolerance. Gerhard Wellein: Performance Engineering for Stencil Updates on Modern Processors. Talk at the Minisymposium “Optimizing Stencil-based Algorithms,” SIAM Conference on Parallel Processing for Scientific Computing (PP14) , Portland (OR), USA, Feb 18-21, 2014. Gerhard Wellein: Performance Engineering for Stencil Updates on Modern Processors. Talk at the Workshop “ExaStencils 2014”, Dresden, Germany, March 31, 2014. Gerhard Wellein: Performance Engineering for Stencil Updates on Modern Processors with the ECM Model. Talk at the “Computing Sciences Exascale Seminar Series,” Lawrence Berkeley National Laboratory, Berkeley (CA), USA, July 25, 2014. Georg Hager: Parallel and Efficient Programming. Five-day block course at the Institute of Physics, University of Greifswald, September 25-29, 2017. Georg Hager: Parallel and Efficient Programming. Five-day block course at the Institute of Physics, University of Greifswald, February 8-12, 2016. Georg Hager and Gerhard Wellein: Node-level performance engineering. Two-day PATC short course at LRZ Garching, December 4-5, 2014. Georg Hager and Gerhard Wellein: Node-Level Performance Engineering. Two-day short course at the second “SPPEXA Doctoral Retreat”, Sarntal, South Tyrol, Sep 22-26, 2014. Georg Hager and Gerhard Wellein: Node-level performance engineering. Two-day PATC short course at LRZ Garching, December 3-4, 2013. Node-Level Performance Engineering. Full-day tutorial at the first “SPPEXA Doctoral Retreat”, TU Darmstadt, Sep 17-20, 2013. Fault Tolerance for Exascale Systems. Seminar at Bergische Universität Wuppertal, Winter term 2012/2013. Georg Hager: Performance Engineering as a guiding principle for efficient implementations of algorithms in computational science. Habilitation thesis at the Ernst-Moritz-Arndt University of Greifswald. The habilitation procedure was successfully completed in November 2014. Lukas Krämer: Integration based solvers for standard and generalized Hermitian eigenvalue problems. Dissertation, Bergische Universität Wuppertal, 2014.